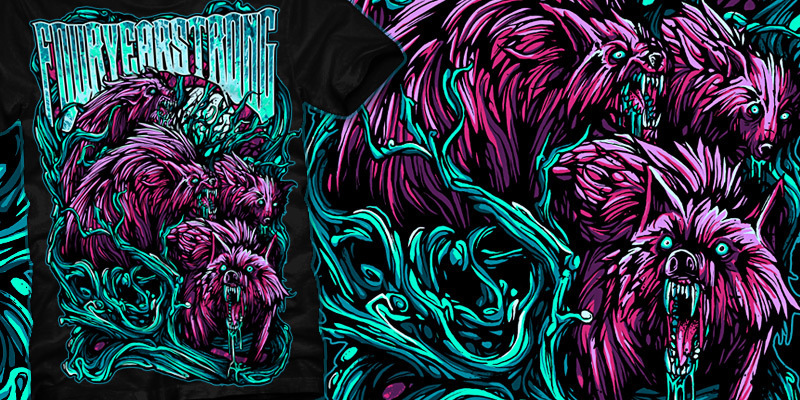 Collaboration tee for Four Year Strong and Rockett, coming out soon i believe. This is also my first ever emptees entry..so..enjoy! weyy the uk contingency grows! amazing !!! and nice portfolio ;) !! Wolves most certainly do white poos. In fact i think thats ALL they do. Thanks Blindax. sick! the colors, execution and overall illustration is great! heavyprints said: I saw this while lurking your portfolio a while back. Amazing work.. Welcome to Emptees man. I have been a fan of your work for a long time. Thanks, its been a long time coming....! Joining emptees that is..not the image! Joined! Yes! You will rule TOTD! ibzombieliquorice said: Joined! Yes! You will rule TOTD! i know, finally i joined! Its godmachines fault..he bullied me into it! well there goes the neighborhood. way to be super awesome at doing things! derekdeal said: well there goes the neighborhood. way to be super awesome at doing things! thanks man! right back at you. immediately logged in to love. wow! Mumford, please have my baby. Glad you're finally on emptees. Love your work. yes! biggest fan here dan!!!!!! Welcome Dan, love this one! I love everything you do pretty much. RustyEight said: Mumford, please have my baby. Glad you're finally on emptees. Love your work. im taken im afraid..and your male! it would never work. This is tops! I'm pumped to see more and more work of yours. were all gonna be extinct with this guy! I'm calling this, ToTD tomorrow. awesome! i was wondering when you were going to show up man! yeaaaaaaaaaaaaaah! starting a mumford chant. Neither of those things have ever stopped me before ;) Haha just kidding. I remember the first time I saw your portfolio and I was speechless. Welcome to emptees! caligulas said: Ahhh Mr. Mumford. welcome. as usual you killed it on this shirt. this sucker has been almost a year in the making, glad its finally going to be released! post the syg collab you did for us! people will flip. everyone, look for this to be on the site early january. GK just did a sick collab with these dudes so were going to wait a bit to drop it. word! i cant freaking wait for this one! Oh yeaah, the SYG will be up soon! Welcome Dan! Your stuff rules!